In a quiet corner of St. Paul's Cathedral is a memorial stone to Sir Christopher Wren, its architect, which bears the legend "If you seek his monument, look around you." A similar thing might not go amiss at The Proact Stadium as a memorial to Barrie Hubbard, three times a Chairman of the Chesterfield Football Club, who passed away in December 2015. Born in Chesterfield in 1939, Barrie was a lifelong fan who lived the fan's dream of bossing his own club. He joined the board on June 3, 1983, with the club just days from closure. Spiralling debts were a monstrous hangover from the Cox era: nowadays a club would just drop into administration, but that wasn't an option in 1983 and with the club facing oblivion, Hubbard came in. Like a number of his predecessors on the board, Hubbard had interests in a local printing firm. He wasn't fabulously wealthy but had the knowledge and experience to make a business successful, and he approached everything with the perspective of the supporter that he was. Money-wise, Mike Watterson provided the lion's share - £91,000 - to save the club but could not put his name to that fact, since he was on the board at Derby, and it was forbidden to be a director at more than one club. The shares were to be bought under the banner of Transworld Publications, a company that the pair owned, but in the event, they were registered in Hubbard's name, causing a wound between the two men that would never properly be healed. If Watterson provided the money, Hubbard certainly gave as much in enthusiasm, vision and sheer hard work. On the playing front, the club bounced back from relegation in 1983 to take the Fourth Division championship two years later, with Hubbard's appointment of John Duncan to the manager's being particularly successful. Off the field, however, directors came and went in an unsettling manner. With the championship secured in the summer of 1985, Barrie Hubbard announced that a "prestigious super-stadium" was to rise, phoenix-like, from the crumbling ruins of Saltergate, providing three sides of seating among accommodation for 20,000 fans, all under cover. It was to be paid for by a new national football pool called "Top Score," which quickly proved to be a dismal flop. The redevelopment, like so many more to come, was abandoned. 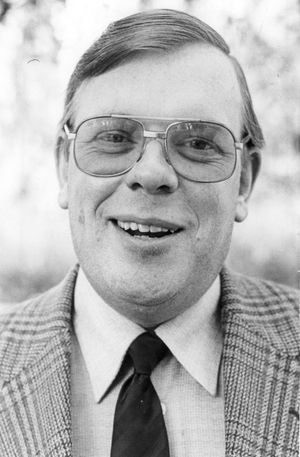 Just before the start of the 1985-86 season Hubbard was summarily removed from the board of directors and replaced as Chairman by Ken Unwin, although Mike Watterson remained as the money man. Rumblings were heard from other board members about an alleged autocratic style on the Chairman's part, but one man's autocrat is another's "firm hand on the tiller," and Hubbard's hands-on approach had delivered success in an affordable manner. Several others tried the club's Chair for size before Barrie returned to it in November 1987. In the meantime the club had slipped alarmingly towards crisis again, as attendances throughout football fell away in response to negative play, hooliganism, poor facilities and a troubling political and economic climate that saw the game's traditional working class foundations crumble. Again, another man - this time, the former Sheffield United and Mansfield Town director, Norton Lea - provided the greater share of the finance, but Hubbard's presence at the head of Lea's consortium brought it instant credibility among the fan base and ensured that the take-over was widely welcomed. Lea eventually took the Chair in January 1991 but Hubbard stayed and, in contrast to some of his past fellow-directors, remained a loyal lieutenant to the man in charge, acting as a buffer between the rather aloof-looking Lea and the fans. With Lea in the Chair and Hubbard supporting him, the club enjoyed a period of success that has not been repeated, following a play-off win in 1994-5 with three successive top-half finishes in League One, while reaching an FA Cup semi-final - all with Hubbard's original choice for manager, John Duncan, back at the helm. Hubbard's public support of Lea won him few new friends among the supporters, but those close to Barrie knew him better than to take seriously the occasional threat to pull the plug, seeing these as no more than badly-worded pleas for support. When Lea failed to deliver a new stadium and abolished the family stand while whacking up prices and selling players at the start of a catastrophic 1999-2000 season, supporters began calling for their resignations. Sooner than they might have expected, perhaps, the fans got what they wished for. Barrie was again removed from the board in 2000, this time by something of a fait accompli, as Lea sold the club to the convicted fraudster, Darren Brown. As before, he kept his own counsel as events unfolded, but was around to offer advice to those who prepared to pick up the pieces as Brown's corruption became plain to see. The Chesterfield Football Supporters Society rescued the club in April 2000 and sought to run it under a fan-ownership model but were unable to raise the sort of sums needed to sustain the club and develop its immediate future. After a couple of years of gradually worsening struggle the CFSS came to an agreement with Barrie that saw his return to the Chair. Hubbard's priority was the stadium. While he was once a proponent of redeveloping Saltergate, its steep decline in later years and its restrictive geographical location had convinced Barrie that the future now lay elsewhere. Having seen off a challenge to his leadership that, if successful, would have thrown the club's limited resources behind redevelopment, Hubbard worked tirelessly to secure his club's future. It was to his immense personal frustration that the project crawled, tortoise-like, towards its conclusion, but countless obstacles had to be overcome - not least, the question of finance. Barrie completed a remarkable day's work when he managed to persuade Dave Allen to buy into the project, and he must have seen that, inevitably, there would come a time when the money-man wanted to be in full control, since this had happened in both previous periods that he occupied the Chair. When considering Barrie's motives for involvement in the club, we would do well to remember that there must have been a moment when he realised that, in order to safeguard the future of the club, he would have to give up control of it. Still, he went ahead. Barrie resigned from the club's board of directors for the last time in May 2012 to become the club's Life President, and he continued to attend matches right up to the end. Where does he stand, in the ranks of Chesterfield Chairmen? Harold Shentall enjoyed a longer term of office and took the club up to the second tier of English football twice, while delivering a completely re-developed ground, but at a great financial cost that eventually led to relegation to the Fourth Division. Harry Cropper was among a group that formed the current club in 1919 as the Chesterfield Municipal FC, but Hubbard more or less started from scratch too, in 1983. Will we ever see his like again? Possibly, but it must be considered unlikely. High-level professional football is no longer the stamping-ground for a local, benevolent businessman, in it only for the love of the club he protects; it is all about money. We've landed on our feet with Dave Allen but had to endure Darren Brown before that. All we can hope, perhaps, is that Barrie Hubbard's successors value the past as much as they look to the future. Having come up through the ranks, Barrie realised this, sharing the same ambitions and perspectives as the ordinary supporter, and this made him the great chairman that he was.